Today I wanted to share my granola recipe. You can customise it however you want, I've gone with a wintery theme of cranberries and cinnamon but you could add currants, apple and whatever spices you feel like. It's really easy to make and can be stored in an airtight container to make taste good for as long as possible. 1) In a large mixing bowl, combine all the dry ingredients and then add a few tablespoonfuls of the maple syrup. 2) Stir together and then pour the mixture onto a baking tray. 3) Bake at 180 degrees. Set a timer at ten minute intervals and at each, shake the tray so that all the pieces are evenly cooked. 4) After around 30 minutes (or when done), take the tray out of the oven and leave to cool. 5) Transfer the granola to a large jar or tin. 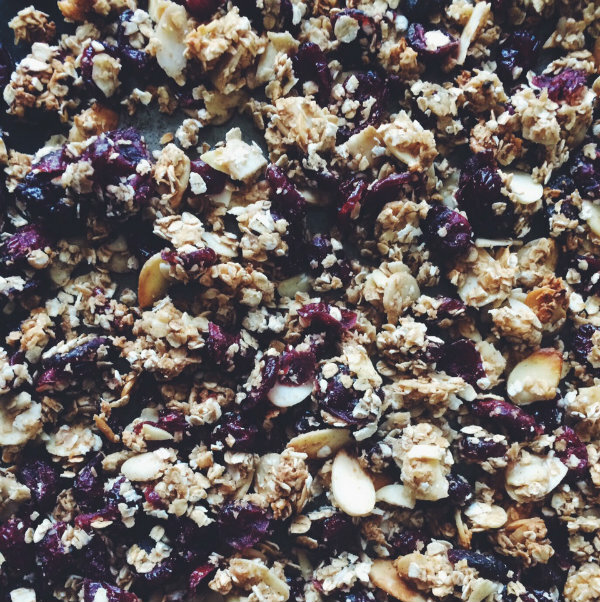 Have you made granola before? Ive contemplated making granola at home and by the sounds of it, doesnt sound too complicated and super yummy! I love granola. Thanks for the recipe, dear. The one thing I love to make is homemade granola but the only problem is I usually end up eating the whole batch by myself. This looks super yummy and nutritious. I must try this, thanks for sharing dear! Ah I made it with a few adjustments! Thank you, everyone thought it was delicious.